This is for the Sims3 creators only! If you do not know what any of the gibberish below means, then you do not need to be downloading this anyways. Please do not ask me how to use custom meshes, how to texture, etc. There are plenty of tutorials and guides out there. Simgeom is used with CTU and S3PE/Postal creations. Alternatively, I've included an .wso version of the mesh for those using TSRW. The neutralbumpmap.dds is a blank, flat bump-map for use when texturing the mesh. This comes in handy when you're trying to drastically alter the alpha of the texture, because the EA bump-map will most likely get in the way. 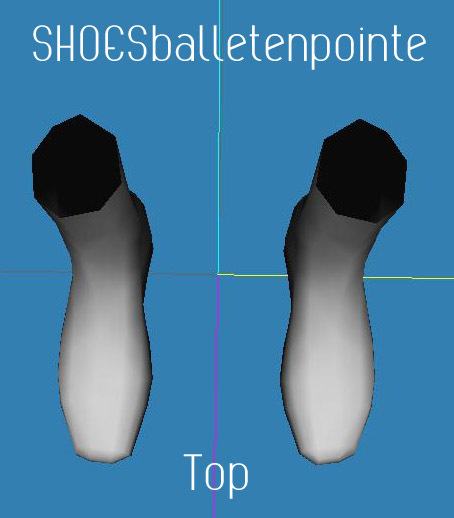 The SHOESballetenpointe_basictexture.dds is the EA texture of the original mesh. When you first start your project, just apply it to the mesh then use it as a guide when texturing. TF-EF use the same texture. All of my meshes are in what I consider "alpha" state. They've been tested extensively in game and have been tweaked and improved overtime. However, people point out lots of things I may have overlooked so always check back from time to time about mesh updates. 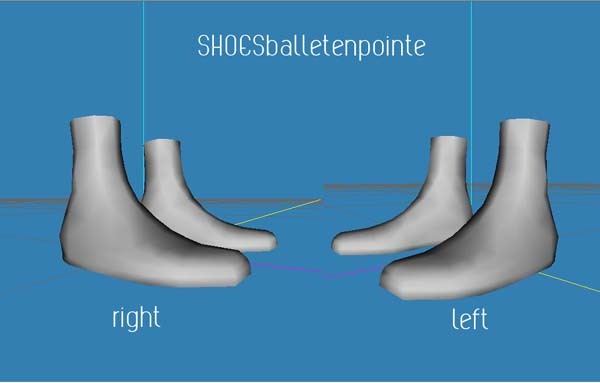 *The mesh is an altered version of EA's ShoesAnkleCLowFlatRound00_balletFabric_lod1 mesh. Therefore, lod2 and lod3 are EA's meshes. 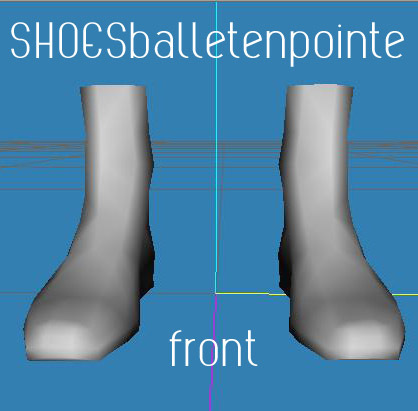 They were included and renamed for sheer convenience and I take no credit for those two mesh parts.